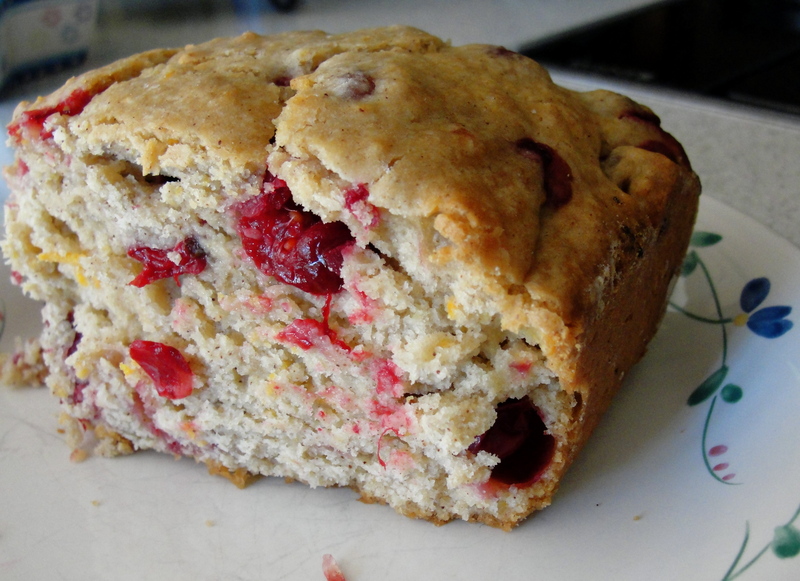 Cranberry Orange Bread – Voila! RALEIGH, N.C. — I’m working from home this week and after a long day of sitting at my parents’ kitchen table on my laptop, I decided it was time to bake. I declared my intentions outloud to my brother who had just woken up (at 12:30 p.m….oh, to be in college), “Don’t you think it would be a great idea to make some cranberry orange bread, David? !” He laughed and I ran out to get fresh cranberries. I’ve been eyeing this recipe for a while so I knew exactly where to turn to make this dream a reality. I left out the walnuts since my dad is allergic, but besides that this bread is delicious! My mom said that some cranberry orange items often lack the orange kick. Not this. This has everything you’d want in an orange cranberry bread: the tartness of the cranberries, the zestyness of the orange and the ability to compliment ice cream or a morning latte. 1. In a large bowl, add sugars and oil and mix until very well combined. 2.Mixing while incorporating, add milk, zest, egg, and vanilla. Mix to combine well. 3. Sift flour, baking powder, cinnamon, and salt over wet ingredients. 4. Fold dry ingredients in until half way combined, about 5 full strokes. 5. Add cranberries and walnuts and fold in. Batter should be just barely combined. Spoon batter into loaf pan and tap to release air pockets. Place pan into oven and bake until toothpick inserted into center of loaf comes out clean, about 50-55 minutes for regular loaf and 25-30 minutes if using mini loaf pans. 6. Remove from oven and let cool in pan for 15 minutes. Turn loaf out onto wire rack and let cool completely before slicing. Oh yay!! I’m so glad you liked it! Especially since after stealing your challah recipe I am a true Voila supporter now 😉 Happy holidays! !